The idea is to get at least three of the guys to go to a zoo with an indoor alligator pond inside one of the indoor buildings with a railing around the pond. The pond needs to be murky and anyone looking down at the pond should not be able to see more than a foot down in the water. 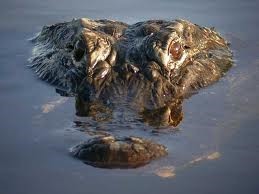 A fake alligator head on a hydroaulic cylinder will be floating at the surface near one side of the pond as that is usually all you can see of an alligator when it is wallowing in the water anyway. A scuba diver will be stationed ten feet down at the bottom of the pond with an extra breathing mask. Have someone like weeman to tell bam that Steve-o recently told him that he keeps $500.00 bucks in the sole of his right shoe just in case Steve-O ever needs it. (This role doesnt have to be steve-o.) Then have weeman tell bam to rip Steve-o's shoe off and throw it in the alligator pond so steve o will panic because his shoe has all his money in it. Bam will mostlikely rip the shoe off and throw it in and then Steve-o (who is in on the prank) will jump right in . At this time have the alligator head on the cylinder dip below the water out of view. As Steve-o is approaching the shoe have the diver under the water yank steve-o down deep under the water and attach the extra breathing mask to steve-os mouth. Have steve-o thrash in the water as the diver is pulling him down. It will appear to Bam that the alligator just dragged Steve-o under the water and due to the fact that Steve-o isnt coming up for air he will think that steve-o drowned. Either way whoever rips off someones shoe and throws it in the alligator pond only to watch the individual panic, jump in for the shoe, get dragged under by "something", and not ever seeing the individual resurface for air would make the "shoe thrower" feel responsible for losing their friend. And then I think it would be funny if SteveO resurfaced 8 minutes later wearing the alligator head. News: Irving goes fishing and drowns to death.